It's official and with five count'em five whole candidates for three BoE trustee seats this fall's November lineup will appear under the following slate names. The following five names and slates are official candidates pending certification per the Hudson County Board of Elections. 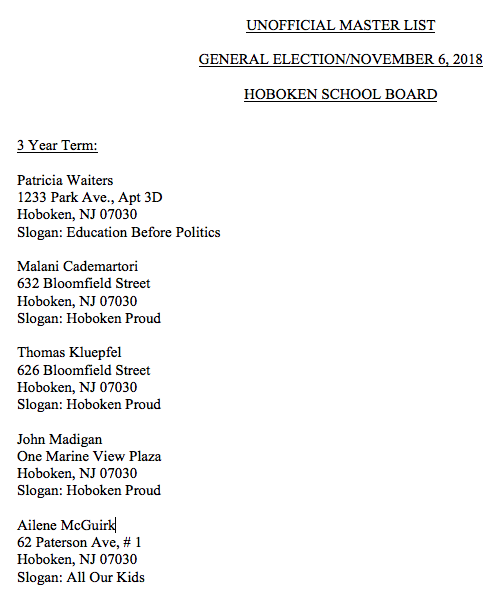 While other nearby towns feature 10 candidates (Jersey City) and 20 candidates (Bayonne) for their respective open BoE seats in the fall election, Hoboken will feature far less. Talking Ed Note: MSV has confirmed an earlier report the recent FBI visit to Hoboken didn't only visit an accounting business on Adams St. There was also an early morning raid on Castle Point. Now into year seven beating down frivolous litigation, more on the FBI story to MSV subscribers and contributors when you hit the button supporting good government oversight in the Mile Square City.